Present Illness: Patient #15, a 75-year-old white female, presented to the Department of Neurology for evaluation of progressive generalized weakness, lower extremity numbness, and double vision. Her problems began 14 months prior to admission with weakness in her left leg, progressing gradually to the right leg and then to both arms. Six months prior to admission, she developed horizontal diplopia which was intermittent and at distance only. Subsequently, the diplopia became constant and occurred at near as well as at distance. During that period of time, she also noted the gradual onset of numbness in both feet. Her symptoms waxed and waned in severity over the last six months. She denied paresthesia, painful cramps, muscle twitching, blurred vision, loss of vision, vertigo, dysarthria, or dysphagia. She also denied bowel or bladder incontinence, fever, night sweats, or weight loss. History was negative for any illness or vaccinations just prior to the onset of her symptomatology. Past Medical History: Left breast cancer, S/P left mastectomy with reportedly negative axillary lymph nodes. No history of radiation therapy or chemotherapy. Family History: Breast cancer, diabetes mellitus. No family history of neurologic disease. Social History: One glass of wine per week; denies tobacco or illicit drug use. General: Well-nourished, well-developed, in no acute distress. Vital Signs: T=99.1; BP=140/70; P=72; RR=18. Neck: Supple with no adenopathy. Chest: Clear to auscultation bilaterally; well-healed left mastectomy scar. Cardiovascular: Regular rate and rhythm without murmurs, rubs, or gallop. Abdomen: Soft, nontender, bowel sounds present. Mental Status: Awake, alert, and oriented to person, place, and time. Speech fluent with normal comprehension and repetition. II Pupils 3 mm and briskly reactive to light bilaterally; visual fields full to confrontation. III / IV / VI Various positions of gaze are shown below. V Normal sensation to light touch, pin prick, and cold. IX / X Gag intact; symmetric palate elevation. XI Sternocleidomastoid and trapezius strength 3/5 bilaterally. XII Tongue midline, without atrophy or fibrillations. 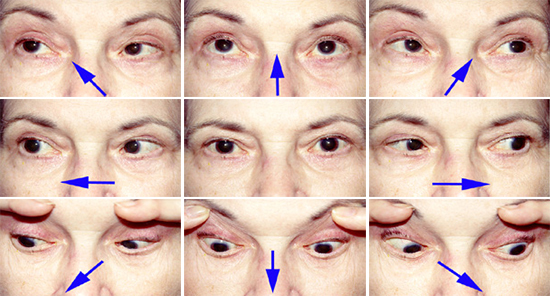 The patient is asked to look in the various positions of gaze, as indicated by the arrows. Pupils were dilated for ophthalmologic exam. Motor: Normal bulk; tone intact. Neck flexor 4/5; neck extensor 5/5. Reflexes: Right biceps 1+, left biceps 0; Triceps 1+ bilaterally; Brachioradialis 0 bilaterally; knee and ankle reflexes 0 bilaterally; Plantars downgoing bilaterally. Sensation: Glove-and-stocking diminution to cold and temperature perception up to mid-forearms and knees bilaterally. Vibration and position sense normal. Cerebellar: Finger-nose-finger and rapid alternating movements intact. Unable to test lower extremities because of weakness. Gait: Barely able to bear weight. Unable to walk.